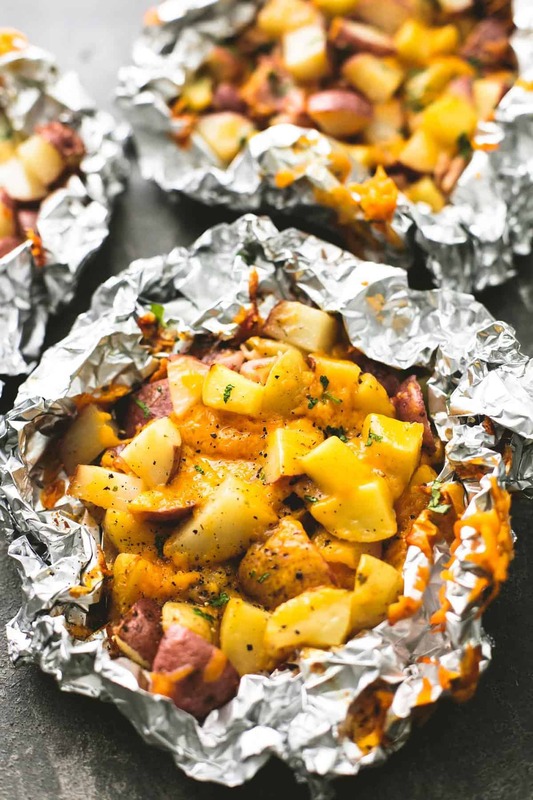 Ultra cheesy bacon cheddar potatoes in foil can be grilled for the perfect summertime side dish for cookouts and camping dinners, or baked year-round for the real cheese and bacon lovers. Where are my cheese and bacon lovers??? I knew we were friends for a good reason. This is cheesy Summer comfort food at its finest my friends and you do not want to miss it. Whether you’re planning a camping trip, a backyard cookout, or a low-key dinner at home, these bacon cheddar potatoes need to be there. These potatoes are cubed, then tossed in a little melted butter, ranch seasoning (the dry stuff! ), salt and pepper, and then topped with shredded sharp cheddar cheese. Wrap it all up in foil and bake or grill and this 30-ish minute side dish is ready to rock and roll. These babies are delicious straight-up, but I also love love love them with ranch or blue cheese dressing, hot sauce (Taco Bell Fire Sauce you have my heart), or bbq sauce. SO DARN GOOD. I mean come on though – bacon. cheddar. potatoes. cooked in foil for easy cleanup. So much love to here. This is exactly what Summer should taste like!! And while we are talking Summer recipes, I’m sharing 5 amazing, totally Summer-worthy easy weeknight meals over at Delish this week – be sure to check them out! 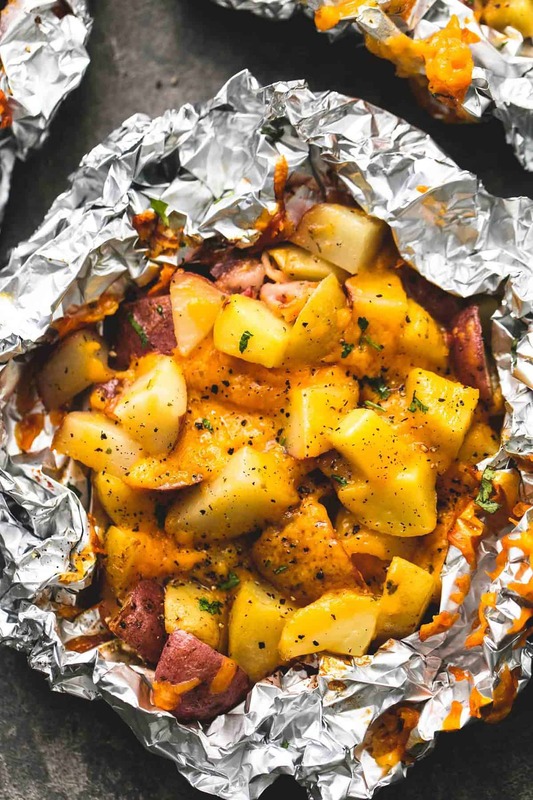 Ultra cheesy bacon cheddar potatoes in foil can be grilled for the perfect summertime side dish for cookouts and camping dinners, or baked year-round for cheese and bacon lovers. In a large bowl combine potatoes, bacon, butter, ranch seasoning, and salt and pepper to taste. Mix well. Portion the potato mixture out into the center of four 12x12 inch pieces of foil. Top with shredded cheddar cheese. 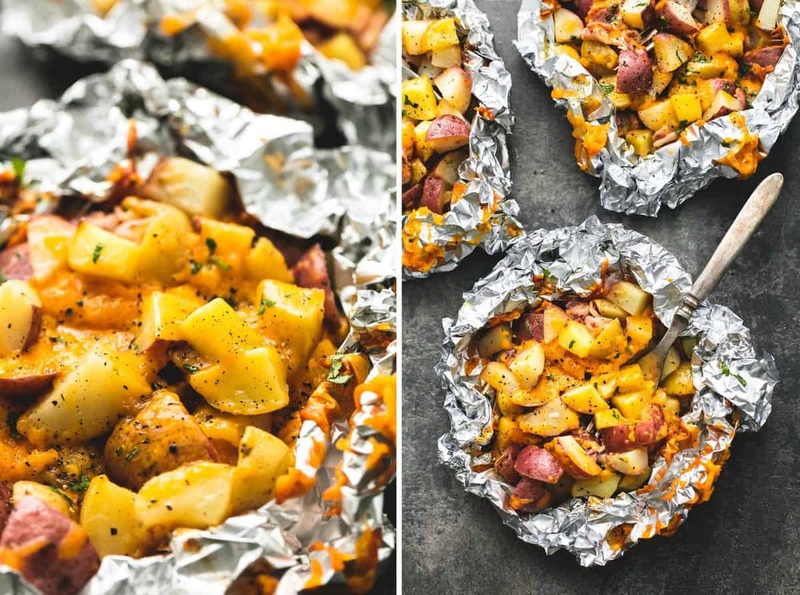 Wrap foil tightly around potatoes. Pierce foil 3-4 times with a fork. Grill over medium heat for 20-25 minutes OR bake at 425 for 25-35 minutes, until potatoes are tender. Top with chopped parley and serve. More Foil Pack Dinners you'll love! I’m so glad I made this as a side. My main dish didn’t work out, but my potatoes foil packets were the bomb. Thank you! At least you had one success! 😉 Super excited that this recipe pulled through for you. Thanks for your feedback, Nicole!